YouTube is one way to add video to your website - see our YouTube tutorial for more information. Another popular way is to use Vimeo - this tutorial will guide you through adding a video to your website. Both of these websites allow you to use their services, so it is easy to embed a video into your website like the example below. They are free to use although Vimeo has premium packaged versions available Vimeo Plus $59.95 per year & Vimeo Pro $199.00 per year. The video then needs to be converted by Vimeo into the correct format and this may take time to do. The following image shows a likely message you will see. 6) Once the video has been converted you can embed it in to your website. To do this view the video and click on the EMBED option in the top right of the video. Edit your web page using the Edit.com web editor and click on the source button at the top of the editor page. 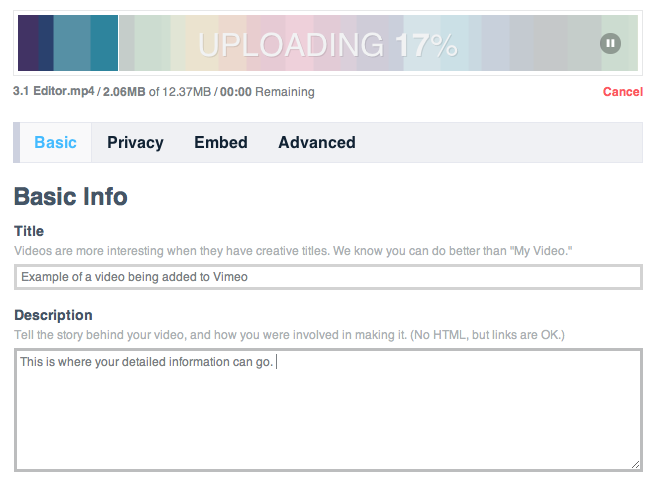 Your Vimeo video will now be on your website for all to see.